We often help families who are struggling to find a great, local assisted living facility for their loved one. Fortunately, our senior housing consultants are experts at finding great facilities within your senior’s budget. These services always come at no cost. However, we understand that the process of finding the right place to live, coupled with the financial responsibility of paying for it, can be very difficult. 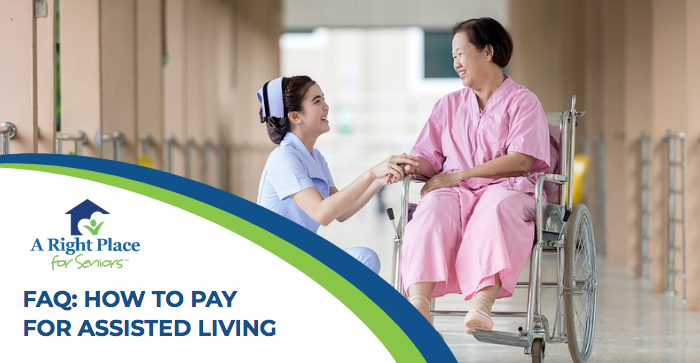 In this blog post, we are answering frequently asked questions related to paying for assisted living. Let’s start with the basics. What is assisted living? In many cases, families or individuals are responsible for covering the costs of assisted living. Most facilities operate using “private pay” models, meaning that individuals must pay out of pocket. That said, they can receive funding from various sources in order to make up that payment. Some pay using personal savings, and some cover costs with their long-term care insurance. Does Medicare pay for assisted living costs? Medicare will often pay for a senior’s medical costs, while they are living in an assisted living facility. However, Medicare will not pay for a senior’s housing costs (room and board at assisted living) or their personal care costs. Yes. Many caregivers and individuals successfully plan ahead by purchasing long-term care insurance. This can be an exceptional help, and lift what could otherwise be a considerable financial burden. If you do choose to purchase long-term care insurance, there are many options for what your policy will cover. It can cover traditional costs associated with assisted living, nursing homes and other housing options. It can also cover in-home care, day-care and other services. Be sure to review policies closely before settling on the right one. You won’t regret taking the time to consider what benefits you might need and anticipating what may become necessary in the years to come. What if we didn’t plan ahead? Do Veterans have financial options for Assisted Living? Yes. Many veterans are qualified to live in VA assisted living facilities, or receive similar services. If you are a veteran and you find that these benefits do not apply to you, you may still qualify for an addition to your pension called “Aid & Attendance.” For more information on these types of benefits, we recommend contacting your local VA office. What if I am low income and qualified? Medicaid can help, depending on the state and county you live in. For example, if you live in California, Medi-Cal offers an financial assistance through the Assisted Living Waiver Program. Participants must qualify and living in a participating county. You can find out more information about how Medicaid may be able to help in your area by visiting this breakdown of nationwide services. Is there any other assistance? The U.S. Department of Housing and Development offers specific resources for seniors. You can talk to a HUD housing counselor personally for help determining options. Can A Right Place for Seniors help? Yes. When we search for housing for our clients, we take into account every component of the senior’s needs. This includes the financial situation of the senior and their family. We can also help direct you toward the correct agencies and services, if you are unsure where to start. Though finances can be a complicated issue to manage, we strive to ease the stress of searching for senior housing by offering our free services. At the end of the day, we hope that you find a great place for your loved one. It is our pleasure if we can assist in making that an easy process. Let us know if you have any questions. You can also contact us for more information on our process. Feel free to share this information if you found it useful!